Exposure to harmful levels of radiation can easily be prevented with a new generation of ultra-small, wearable dosimeters. Less expensive, simpler to use, and portable, Thermo Scientific’s EPDs (electronic personal dosimeters) set a standard for trusted performance in electronic personal dosimetry. The recently introduced Thermo Scientific EPD Trudose delivers performance and reliability with all the modern features expected from a portable radiation detection monitoring instrument. The Trudose delivers real-time readings that improve safety by providing ultra-precise dosage information. This EPD offers new benefits that allow the user to measure ‘Pulse Field Radiation’ as well. The innovative multi detector technology allows measurement of Alpha, Beta, Gamma and Neutron radiation, and the improved dose-rate range accuracy, which measure as low as 0,05 micro-sieverts per hour, provides assurance in the accuracy of measurement to anyone at risk of exposure to a radiation source. Via the newly added warning thresholds, personnel are empowered to respond to alarms, or even react before they occur, due to the enlarged easy to read graphical display. The instrument also enables real-time monitoring of multiple personnel through its networking functionality. 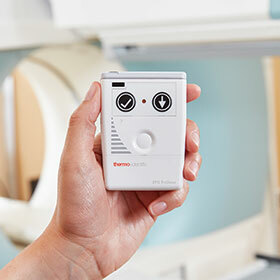 In the fight against radiation exposure and contamination, smaller devices are perhaps the industry’s biggest advancement in recent years, with their capability to sound different types of alarms depending on the threat level, and keeping an accurate account of detected radiation. Naidu explains that it is essential to select the right device for a specific requirement. For example, while the lightweight Thermo Scientific Trudose may be useful for many industry applications, the RadEye PRD would be required for a customs officer looking for hidden sources of radiation. At 160 grams, the more specialised RadEye PRD is up to 100 000 times more sensitive than typical electronic dosimeters. In addition, these new dosimeters capitalise on the power of big data. With their recording and archiving features, exposure can be closely tracked over periods of time ensuring that exposure remains within safe thresholds, pegged by South Africa’s National Nuclear Regulator at 20 millisieverts per year, averaged over the past five consecutive years.